Last week I mentioned that we made sandwiches with the Rustic Rosemary Garlic Bread. As if the bread alone wasn’t incredible enough, we had to go and make Open Face Roasted Vegetable Sandwiches! 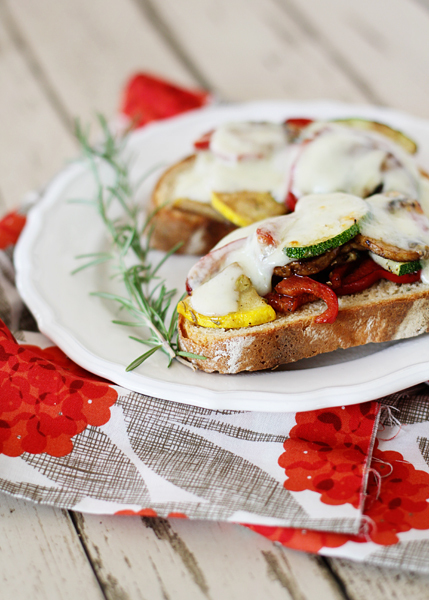 Rosemary Garlic Bread topped with balsamic and olive oil roasted squash, zucchini, and bell peppers smothered in melted provolone. Are you hungry yet? Now, I know that the bread recipe isn’t something you can do on a busy day, but if you’ve already got the bread (by the way, it stores very well in the freezer so you can keep one loaf for now and one for later) then Open Face Roasted Vegetable Sandwiches are an excellent quick lunch or dinner idea. If you want to keep the dishes to a minimum, line the baking pan with foil when you roast the veggies. To speed the slicing I used my food processor to slice everything. It took seconds. Seriously, so fast! And I just put the food processor in the dishwasher after so I didn’t have to deal with washing it. If you’re up for a heartier meal, try it with a side salad or some soup. I imagine that it would taste great paired with Roasted Tomato Soup with Sweet Onion or this Homemade Cream of Tomato Soup. Quick…Easy…Fast…Simple…Meatless. 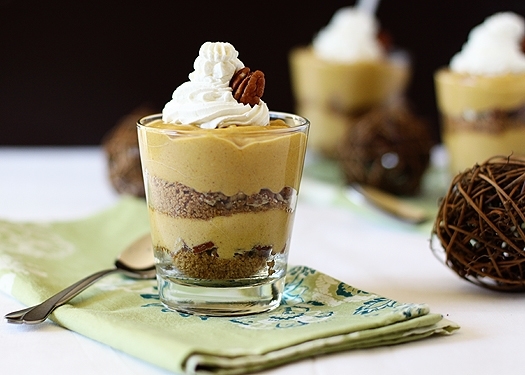 The recipe doesn’t have to be boring to fit that criteria. Preheat oven or toaster oven to 425 degrees F.
Thinly slice all the vegetables, about 1/4 of an inch thick. Line a baking sheet with foil. 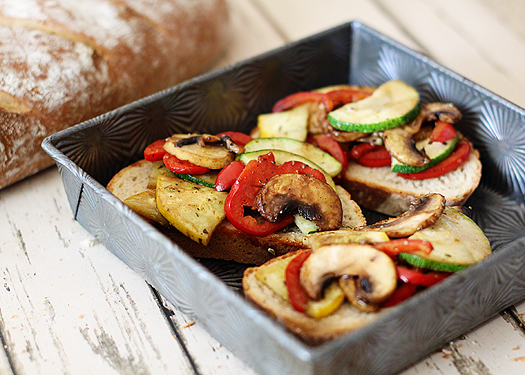 Toss the vegetables with olive oil and spread out on the baking sheet. Drizzle with balsamic vinegar and sprinkle with salt, pepper, and oregano. Roast at 425 degrees F for 10-15 minutes. 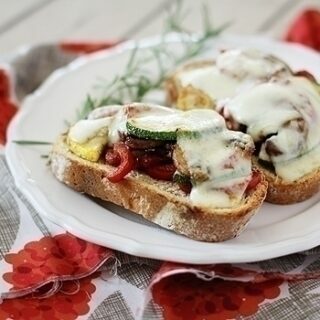 Top each slice of bread with vegetables and cheese. Remove the dirty foil from the baking pan. Place the sandwiches on the pan and cook at 425 degrees F for about 5 minutes, until cheese is melted and bread is toasty. 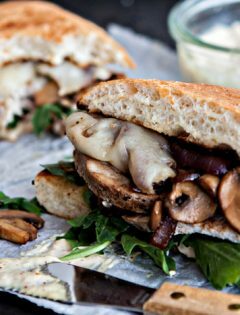 Looks like a delicious use of your rustic bread! This is exactly my kind of thing. 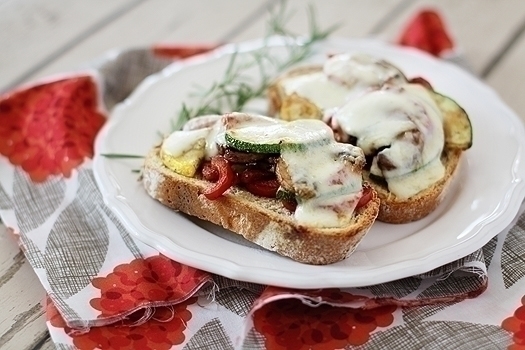 A rustic bread with freshly grilled or roasted vegetables, topped with some cheese. Oh God I’m salivating! Right up my alley Katie! For some reason, I never think to have sandwiches for dinner. This really looks like a meal – especially paired with soup. Love this sandwich! 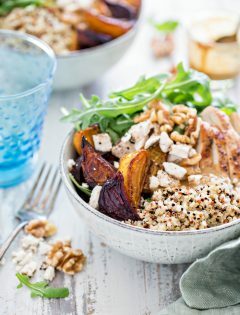 I love the combo of roasted vegetables with mozzarella cheese! My daughter just messaged me this recipe and it so happens, I am roasting veggies tonight. I make lots when I do so that I have leftovers for pasta sauce and for eggs in any number of variations. Yummy good and this sandwich is now on my list. BTW, if you don’t have bread – roast a portobello and use it as the crust. Very meaty. 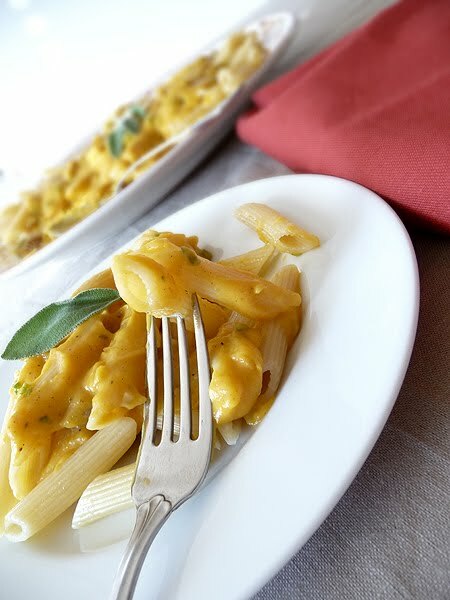 this looks like it might become a weekend lunch for us — delightful! I am roasting veggies tonight. I make lots when I do so that I have leftovers for pasta sauce and for eggs in any number of variations. Yummy good and this sandwich is now on my list. BTW, if you don’t have bread – roast a portobello and use it as the crust. Very meaty. 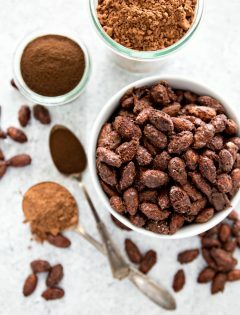 You will pass this one on, I added sun dried tomatoes and it was even more amazing, yummy!